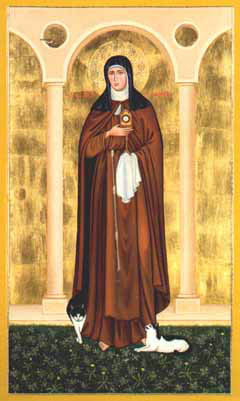 As a Franciscan, I love learning about St. Clare. She was young and impassioned, but a strong leader. Most of all, her Faith was focused in the face of opposition from nearly everyone around her. There are several images of Clare with the Eucharist, and others with a cat, so I chose the one above with both. At one point, her convent was being over-run by the Saracens, and she is said to have driven them out holding the Eucharist in a monstrance, shielding the building and her Sisters. She also had a affinity for cats. One writer suggests that cats, as pets, are good contemplative companions, and any of us that live with cats can agree to that, I think. They are wonderful playmates and provide lots of entertainment, but are also perfectly content to sit and well, contemplate. No wonder Clare enjoyed them!